Everything going on in this dash cam highway pileup crash video probably couldn’t have gone any worse. I’m not exactly sure how a tiny Toyota Celica can manage to flip another car by rear-ending it under braking, but to have that car going flying across three lanes of traffic and cause a pileup is just about as bad as a rear-ending can get. And then the Celica swerves left, right into a truck parked on the shoulder. 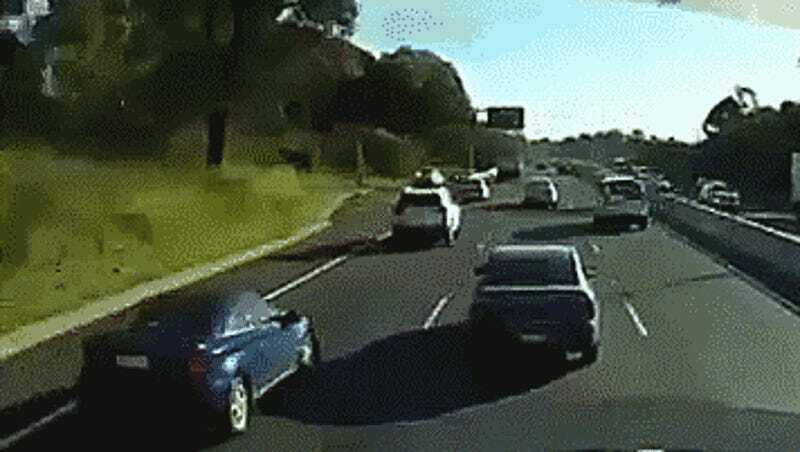 The crash happened on the M5 motorway near Sydney, Australia. All-in-all, two people were taken to the hospital including the driver of the RAV4, and seven vehicles were involved the wreck, according to the Daily Mail. This video is a perfect example of almost every example of bad driving; speeding, following too close, swerving to avoid something, parking on the shoulder (though it does look like a service truck), etc. Luckily nobody was seriously injured.